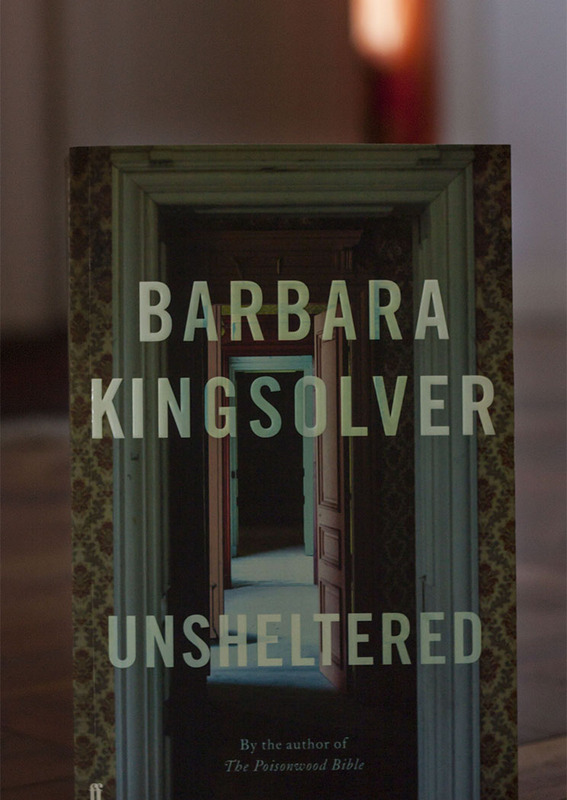 Barbara Kingsolver’s latest novel, Unsheltered, rejoices at the magnificence of the sky under which we are likely to die. If there is comfort to be found, a respite from the grief that sets in with the acceptance of scientific observations that our natural world is about to end, and us with it, it may exist within the pages of a Barbara Kingsolver novel. Not because she is escapist, but because she accepts the facts, and fashions some sort of meaning from the fabric of our humanity. A scientist herself, Barbara doubtless stares the facts in the eye, sees the void, and recognises that we all flinch, and that the flinching is not a failure, it is human. By the act of looking, we already succeed in coming to know, and knowing takes courage. A naturalist, she places a high value on curiosity, and as a naturalist she gives us grace, her characters the benefit of the doubt. Which is all we ever owe anyone. In this way Kingsolver is a kind writer, is forgiving. Her characters care about one another. It’s not that malice is unacknowledged – terrible aspects of human nature are observed – but it’s never invited into the room. We trust the people we meet, who are themselves affected by malice, by ignorance, by bigotry. They are like us, and we are able to relax and allow ourselves to care for them too. Climate change, which is moving with hurricane speed to climate chaos, is also acknowledged for the reality that it is, and is a central part of the plot in her previous novel, Flight Behaviour, affecting lives with the force of a butterfly’s wings. A Monarch butterfly. A misplaced mass of millions of them. But her heart – her novels’ heart – lies in the domestic world, the world in which we live, the one we grapple with every day; our feelings. Her main characters, her best characters, are mostly women. Wonderful women who, to know them makes it impossible not to love them. Women who act and feel, who prevaricate and have doubt and courage. Her men seem a bit more descriptive, we get to know them more by their actions than their feelings. But then this is possibly how men are. They are not the less compelling and lovely for it, they just don’t always get as much page time. An even in Lacuna, which is as intricate and mesmerising as a mandala, the story of her male protagonist’s life from boyhood to middle-age through the 1920s to the ‘50s, is told – although in his words – by his housekeeper, who is a woman. In her latest novel, Unsheltered, it is not climate change, or societal bigotry and the cold war, that directs the current of her character’s lives, it is capitalism. The same capitalism and growth principle that has created global warming, greed being its master. Ignorance, in this case wilful and wedded to religion, is also an obstacle, particularly for Thatcher, who we find in the 1860s, and who we partly also come to know better through Mary Treat, who lives next door. The kind of woman who would spend hours with her finger in a venus flytrap in order to observe whether it was able to digest human flesh. Thatcher, a science teacher, newly moved to Vineland, New Jersey, is in love with his wife Rose and has married up socially but also has to look after a widowed mother-in-law and the debt trap that turns out to be their house. The materialism of late stage capitalism and its breakdown of American society about 150 years later, is the environment Willa inhabits. A journalist (once employed, now freelance), she is married to Iano and remains sexually thrilled by him after more than twenty years. Their children are young adults. They have also just moved to Vineland, where she discovers the foundation of their home is non-existent. Houses are a main feature in Unsheltered. The cost of them. Their significance. The need for home, for shelter. Sometimes shelter is not found in a house. It can be found in a book.